Even as we continue to watch the evidence trickle in that Donald Trump conspired with Russia to alter the outcome of the election, we now have proof that Trump did cheat domestically. His campaign’s data firm Cambridge Analytica stole user data from fifty million Facebook users and plotted the campaign’s strategy around that illegally stolen information. Now that we know Trump cheated to win the election, what happens now? I’ve consistently tried to explain from the start that once it was eventually proven that Trump cheated, a trap door wasn’t simply going to open up under him. In the eyes of the Constitution, cheating to win an election isn’t actually a crime, unless specific laws were broken in the process. In this case the Trump campaign did violate various privacy laws and cyber laws by stealing Facebook user data, and also committed crimes like conspiracy against the United States by working with the Russians. These crimes are impeachable, but they’re not any different than any other crime. 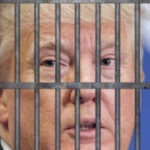 Trump being impeached and removed for rigging the election would be no different, under the law, than Trump being impeached and removed for robbing a convenience store. That’s not my view. It’s the view of every legal expert I’ve discussed the matter with over the past year-plus. None of them believe that the Constitution gives the Supreme Court, or any other governmental entity, any authority to “nullify” the election results or to order a new election. Other nations have constitutions that allow for that kind of thing, but that’s because they wrote their constitutions after we wrote ours, and they didn’t make the same naive mistakes that our Founding Fathers made. Hillary Clinton was the rightful winner of the election, and even as more proof arrives by the day, in the eyes of the Constitution, it simply doesn’t matter. No matter who is ultimately ousted or arrested, from Donald Trump and Mike Pence on down, this four year term will play out according to the presidential order of succession. This is going to be a four year fight, as I’ve consistently tried to warn everyone since shortly after election day. Anyone claiming otherwise is either mistaken, or trying to sell you a bill of goods. If this sounds depressing, it is. We’ve always tended to blindly assume that the Constitution would automatically protect us in any crisis of democracy. The reality is that the Founding Fathers never saw a villain as cartoonish as Donald Trump coming, and in fairness to them, neither did we until he was upon us. But the upside is this: Trump will be removed from office, if not now, then after the Democrats win the midterms. He will end up in prison, because even if Robert Mueller can’t put him there, the State of New York will. He’ll get what he deserves. It’s up to us to change the Constitution in order to make sure that no one gets any funny ideas about cheating in this manner going forward.